In this unit, we will read a graphic novel by Vera Brosgol entitled ‘Anya’s Ghost’. We will explore the techniques of comics and evaluate the literary merit of the medium. At the centre of our inquiry is the concept of adolescent ‘identity’. In what ways are graphic novels an ideal medium for exploring adolescent issues (social, psychological and physiological)? We will develop our communication skills (viewing) and creative thinking. We will analyse pages from Anya’s Ghost before producing our own pages for an original graphic novel. 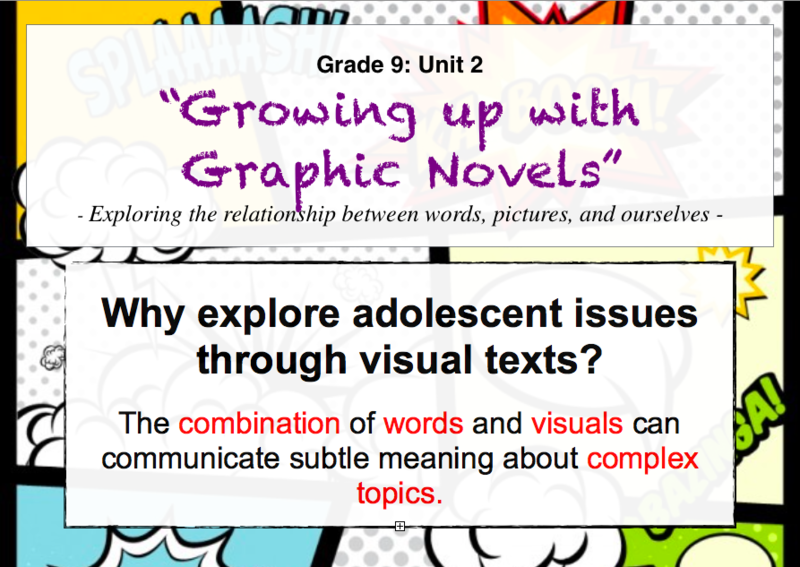 In this session, we will brainstorm what we already know about graphic novels and adolescent issues in order to ‘tune in’ to the unit. We will start to consider the ‘merit’ of studying graphic novels as an artistic form and introduce the text, Anya’s Ghost. We have all had lots of practice at analysing traditional written prose. But how do you ‘pull apart’ a comic page? Today we will start learning key vocabulary and start practicing the art of analysing a comic page using extracts from Kazu Kibuishi’s Daisy Kutter. Last time we learned that there is a specific way of reading graphic novels. However, that does not mean that we completely disregard everything we have learned about traditional narratives. Today we will revise universal narrative elements and use them to summarise the story. Today we learn how storytellers use the camera to tell a story. Using different types of shots, storytellers can communicate subtle meaning about characters, settings, and plots in all types of media – comics, ads, animation, video games, and more! Marketing research over the past few decades has revealed the profound psychological and physiological effects of colour on an audience. Today we will learn some common associations of colour and see how it is used in an advertisement directed at teens. Today we will look at the techniques graphic novelists use to speed up or slow down time for the reader – this is called narrative pacing. We will look at some examples as a group before creating our own mini comic strips using some of these techniques. Why are we obsessed with cartoons and child-like depictions of real life people, objects, and things? Today we examine the differing effects of choosing realistic vs. abstract portrayals in comics in our study of abstract and iconic styles. What happens between the panels is just as important as what happens within them. This is because of something called closure – the process by which we use our experience and imagination to ‘fill in the gaps’. Today we will examine six different types of panel transitions to understand the role of the reader in constructing meaning in texts. The relationship between words and pictures has a long and rich history. By using both in specific combinations we can create interesting effects. Today we examine the different combinations of words and pictures in graphic novels. In these lessons, we will apply our knowledge of graphic novel techniques by analysing Anya’s Ghost. We will plan, write, edit and proof-read a five-paragraph analytical essay. In these lessons, we will learn about important physiological and emotional changes that occur in adolescents as well as the issues that they commonly face. In groups, we will read informative articles and practice key reading skills of identifying the main idea, summarising and synthesising before presenting information to the class. A famous website / magazine / newspaper popular with adolescents needs a new comic strip – you have been commissioned to help! In the final lessons of this unit we will learn how to plan and create a comic strip to entertain and communicate an adolescent theme to a specific audience. We will also justify our creative choices in a rationale. … Cannot be unseen! In the final lesson, we will reflect on our learning in this unit ‘Seeing is Believing” by sharing each other’s comics. We will then discuss the unit, giving suggestions for further improvement as well as complete a reflection on our own approach to learning. Thank you for sharing I appreciate. This is a wonderful unit, thank you so much for sharing it publicly. I am teaching American Born Chinese, and your resources on the nuts and bolts of graphic novels have been so useful.